Asda Tyres supported Tyre Safety Month by dedicating a page on its website to the campaign and holding two events during October 2015. The first was to inform Asda colleagues at its Leeds headquarters on the importance of tyre maintenance, while the second targeted customers in Colne. Take a look at how Asda Tyres got involved with Tyre Safety Month 2016. Why did Asda Tyres get involved? As part of the Asda brand, Asda Tyres has a strong commitment to the communities in which they operate. 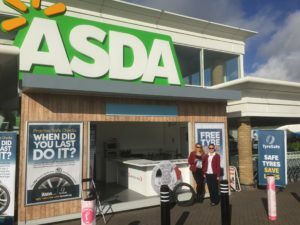 Tyre safety awareness has a key role to play in road safety and Asda Tyres wanted to help inform employees and customers of the need to regularly check their tyres. What did Asda Tyres do? Asda Tyres demonstrated their commitment to TyreSafe by dedicating a page on their website (www.asdatyres.co.uk) to promoting TyreSafe, which also included a ‘Proud to Support’ TyreSafe logo. They also created a page promoting Tyre Safety Month on the main Asda website: (www.asda.com). When customers finished their shop online, they were able to see a TyreSafe button supporting ‘Safe tyres save lives’. 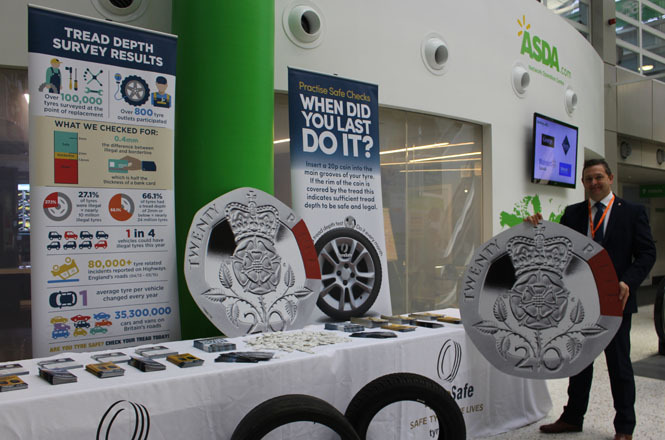 Asda also advertised TyreSafe with atrium events with posters and pop-up banners displaying TyreSafe campaing materials and logos. At both the colleague and customer event, over 400 people engaged with the tyre safety awareness activity with the majority commenting that they would regularly check their tyres as a result. More than 50 had their tyres checked by the experts on hand.